This integration is only available for customers on the Professional pricing plan. Please get in touch if you're interested in upgrading your plan. Abacus supports a direct integration with NetSuite that syncs over both reimbursable expenses as well as corporate card expenses. When reimbursable expenses are approved in Abacus, we will sync over a Bill & Bill payment into NetSuite to reconcile those expenses. When corporate card expenses are approved, we push in individual entries for those charges. The entry will include two line items: 1) a debit against the account and 2) an offsetting credit against your corporate card account. You also have an option to sync on an accrual basis. 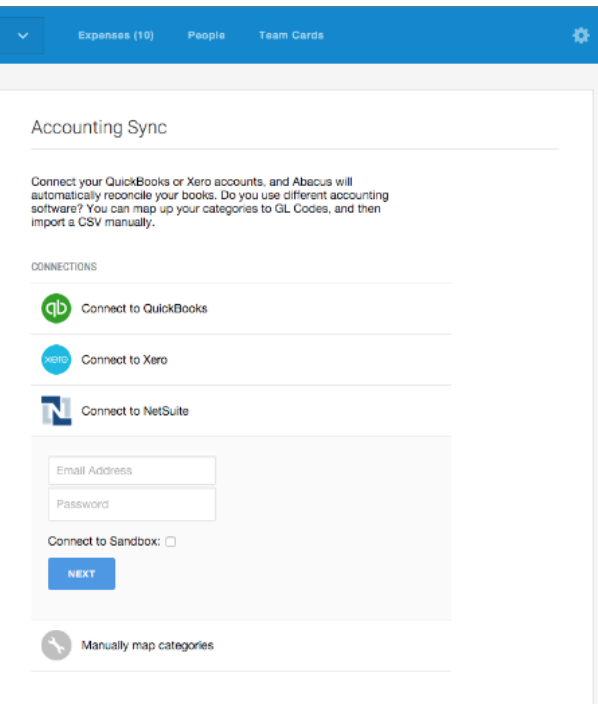 Below are instructions on how to integrate Abacus with your NetSuite account. When on this page, make sure you go to the SuiteCloud tab and then check off four options that we need 'on' in order to sync data. When on this page you can search for "Abacus" and when it appears as a search result, select it then click on Install and Install Bundle. This will bring you to the 'Installed Bundles' page where you will see the download of Abacus pending. It will take a minute or two to download. We recommend waiting until it has loaded completely before moving on to the next step! 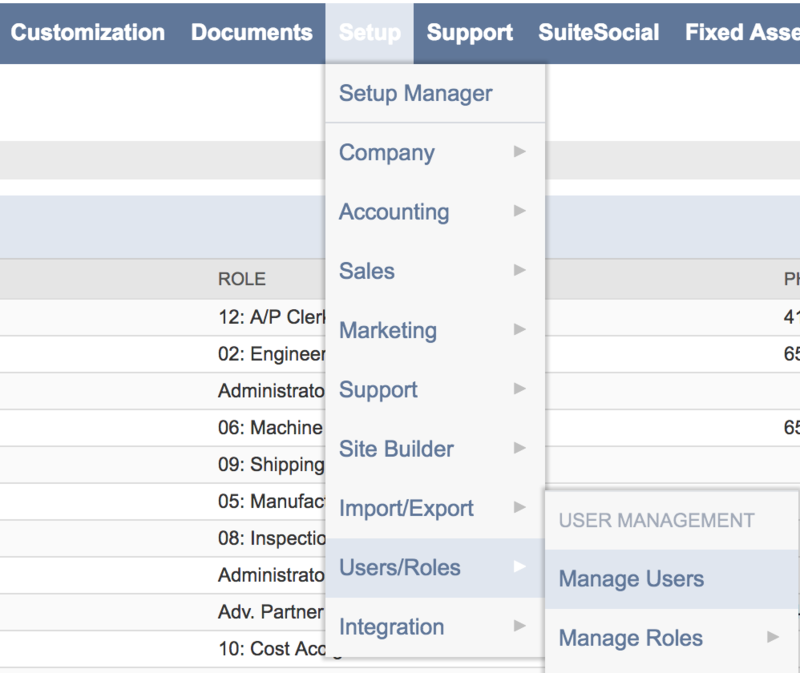 Now you will assign an Abacus "Role" to a NetSuite user. This will be the user log-in that you use later to initiate the connection between Abacus & NetSuite, so the credentials should be accessible and preferably be for a system admin. We recommend that you create a NEW NetSuite user, ascribing the Abacus permissions to that user. This will allow the account to remain usable if someone leaves your accounting team. Under "Roles," Add "Abacus Integration"
Please note-- If you have multiple subsidiaries make sure the user you are assigning the Abacus Integration role is assigned to the exact subsidiary you will be connecting to Abacus! Click on "Connect to NetSuite"
You will now be asked to pick which company in NetSuite you would like to connect to. If this login can only access one company there will only be one option in this list. If the list is empty it means none of the companies have a user with the Abacus Integration role (See Step 3). Once Abacus is connected to your Netsuite, the next step is customizing the integration with your Netsuite. First, select a default expense account. For any expenses that are missing a category in Abacus, this default expense account will be applied. This should be something like 'miscellaneous' or 'other expense' in your chart of accounts. Keep in mind that if any items in your GL change in NetSuite, they'll also need to be updated in Abacus. Here is where you will select Cash or Accrual method of syncing. For more information on these options, read this article on Accrual accounting with Abacus. Once this is set, select the bank account that's being used to reimburse your expenses. This is the AP account that you want associated with the Bill and Bill payment. 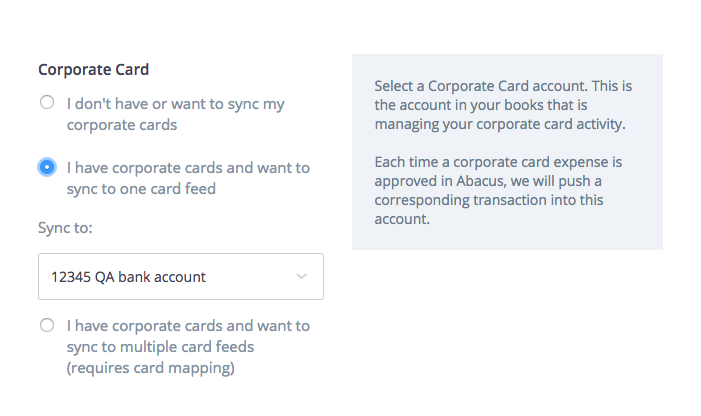 You have several customization options for the corporate card sync, depending on how you'd like the data to sync. 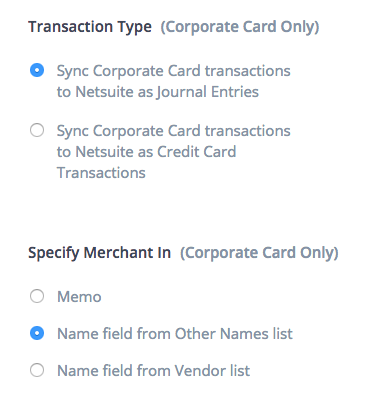 For Transaction type, you can choose to sync card transactions to NetSuite as either Journal Entries, or Corporate Card transactions For the vendor/merchant, you can opt to sync that information into the Memo field, or the Name field. For the Name field, choose whether you want the vendor name stored in your Other Names list, or the Vendor list. TIP: many customers choose to sync the vendors to the Name field from the Other Names list, to avoid making a mess of your vendor list! Abacus pulls in Class, Location, and Department information from your NetSuite. You have the option to create custom fields in Abacus and map them to these fields in NetSuite. 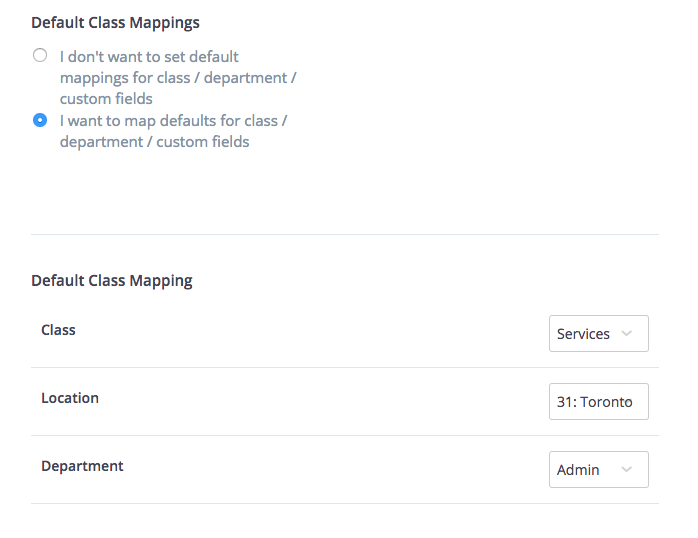 Read more about setting up custom fields and mapping them to your NetSuite here. To complete the integration, navigate to your Categories page, and map each item to the corresponding expense account. Now you have successfully connected to NetSuite! Team Fields are customizable fields that you can add to a user's profile, like Department or Team. This data will be attached to employees expenses automatically. Expense Fields are customizable fields that you can add to the expense submission form. You can create a custom drop down menu on the expense form for your employees to fill out while submitting their expenses.